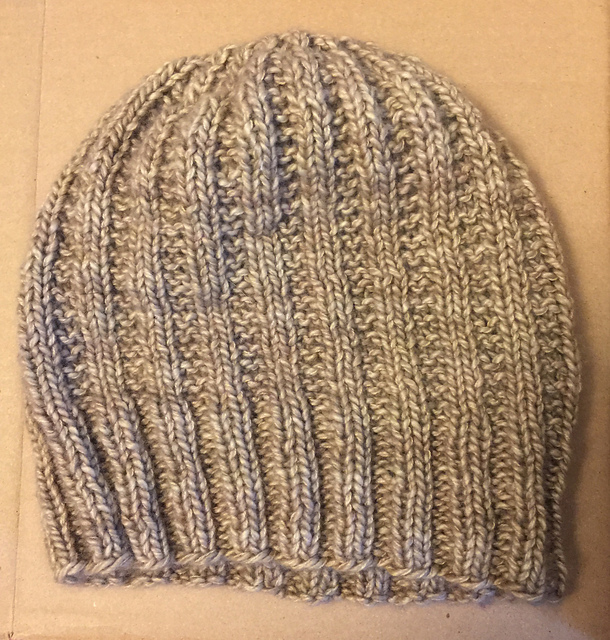 I finished this hat last night. I was so in love with how soft it was, that I put it on immediately. And I couldn't take it off, even when I went to bed. It was that scrumptious. Predictably, I woke up to a sadly crumpled hat. I'll give it a good steam blocking later this morning and share it with you. It's a bit sad at the moment. And in other news, I'll be wearing one of these today. The kit for this hat arrived last weekend as you may recall from this post, and I cast on Tuesday evening. And couldn't stop knitting, because the yarn is wonderful and, of course, the colors. It's really the perfect hat. Even Miss Figg thinks so. And, never one to let scraps go to waste, my daughter already has a project in the works for the tiny snips of leftovers. The verdict: Sure this is a simple idea and you could put one of these together with your own scraps. But half the fun of this project was the kit, which arrived so beautifully put together. I had not knit with Blue Sky's Woolstok before and am so glad I did. It's a really nice yarn and the colors are beautiful. I'm sure I'll do another with my own scraps at some point, but I'm so glad I started with the kit. It's amazing, right? You can just feel all of that softness jumping off the page. This is some 100% angora, naturally produced and undyed yarn, that I ordered from Seidenhase.de. Seidenhase literally translates as silk bunny, and nothing could be more apt. This yarn is amazing. I'm not sure what to knit with it yet (two skeins, approximately 235 meters/257 yards, so enough for some nice fingerless mitts or a hat). I'll likely hold the two skeins together to even them out, as they are a bit different in gauge, but look to be mostly a dk or light worsted weight. For now, I'm just going to pet these sweet little skeins and wait for inspiration to hit. If you have any ideas for me, please share them in the comments! It's dry, hot and still in the '80s in Alabama. But the mornings are cool and despite the drought, there are lots of pretties in my garden to draw my interest while I sit on the porch and knit. Fortunately, my 21 color slouch hat is a project that requires little attention, so I've been checking out what's still blooming and getting some colors in mind for dyeing. I love my Echinacea. It's so pretty. This is the last of it and I'm especially intrigued by the yellow over brown over green in the cones. That blue-pink is a knockout too! Tomatoes. They are little gems! Ina Garten's new book, Cooking For Jeffrey, has a great recipe for roasting them while still on the vine. I adore my Pineapple Sage. It smells great and makes a lovely tea. Although most of my garden is based on drought-resistant plants, this sage requires some water while it's getting established, but my big established stand of this herb is almost 5 feet tall and coming through the drought in great shape. I grow Mexican Bush Sage (Tagetes) because Tarragon doesn't grow well in hot, humid southern summers, but this herb offers the same licorice flavor for chicken salad and soups. And it has the added plus of its flowers. This explosion of color make me want to hit the dye pots this weekend to come up with yarn for my own version of the 21 color slouch hat, in hues from my garden. It came in an email from Churchmouse Yarns and I had to have it. Right away. It really doesn't get any better than stripes and a slouchy hat! 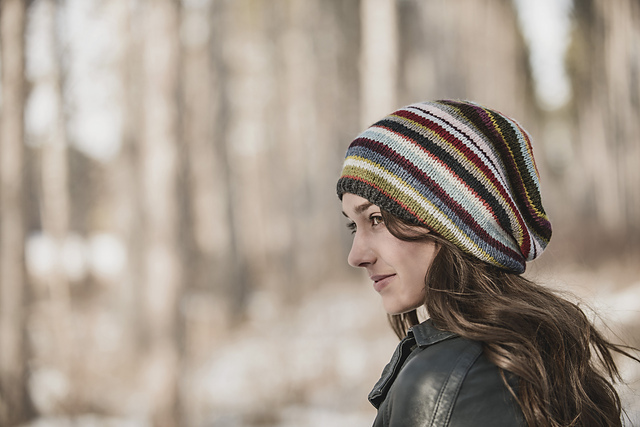 The pattern, called the 21 Color Slouch Pattern, is available only with a kit of color in Blue Sky Woolstock. The cute put up of the kit, with mini-skeins wrapped around a leather cord, is almost as much fun as knitting the hat. I put everything else aside last night to get started. It's a fun, compulsive knit, although there will be a lot of ends to weave in when it's finished.